Grayson, Emma, Kuiper, Juno, Maebe, Turner. I love to have Regan from Kuri K9 come to massage my pets. We have monthly appointments and she even comes to me at my pet grooming salon to see my dogs while I work. The service is totally convenient and I see the difference in my pets. My older miniature poodle benefits from her monthly massage and i see the difference in her mobility. Regan also sees my other dogs who are show dogs and preform at their highest potential when they feel good, especially after a massage. My dogs are relaxed and happy to see Regan every time she walks through the door. 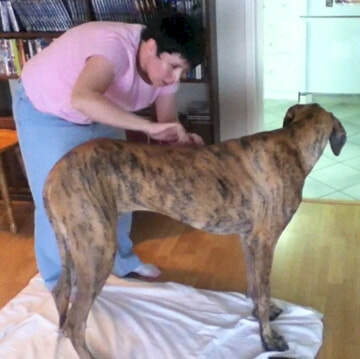 Waldo and Homer's Mom, Hannah R.
Regan has given massages once a week to both dogs for four years. She's GREAT! Both dogs love her, she unwinds tension and puts them at ease. Isis and Casper's Mom, Priya R.
Regan has a very comforting presence and was such a help with my two cats when I moved from a condo to a house. I would highly recommend her massages for your fur babies! We were referred to Regan following our dog's TPLO surgery, and her massages were very helpful in speeding Jet's recovery. She is knowledgeable, skilled, and Jet adores her. We continue to have her visit regularly as her magic touch helps to alleviate his arthritic pain. We are happy to recommend Regan. After our dog had neck surgery it was recommended we try massage to assist with healing after recovery. We found Regan and reached out and she came up with a treatment after reviewing Charlie’s file. The massage did indeed make a difference and helped speed his recovery and he was mobile and pain free in no time. We saw the how happy and mobile Charlie felt after seeing Regan, we have continued to work with her for the last 5 years, as he ages, to keep him comfortable and his body from feeling stiff, it makes a difference in his movement and mobility. He is a small dog and stairs and walking take their toll! Charlie gets so excited to see Regan, he quickly runs to his massage mat and stretches without having to be told, he looks forward to their visits. Regan made a difference with Charlie we decided to try massage with our cat, after being diagnosed with arthritis in her hind legs. Regan patiently worked with her to make her feel comfortable with the movements and touch, and Cashmere was quickly won over. It was amazing to see how Regan and Cashmere interacted and the change it had in Cashmere’s comfort and attitude, she was a more mobile and happier cat for days after her bi-weekly session. 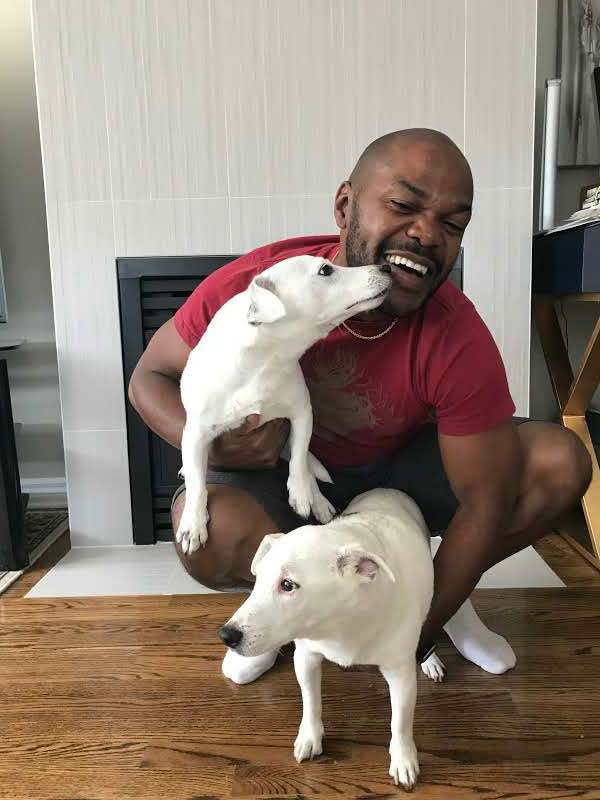 Charlie and Cashmere would not hesitate to recommend Regan for any canine or feline! My 9 year old Bengal cat, Leo was very responsive to Regan's massage. He particularly like the tapotement stroke that she used on him...like playing a piano... He was quite talkative with her and was very comfortable with her incredibly gentle and calm approach. He walked away often, but didn't hide and was easily coaxed back. He is a pretty healthy boy but seemed to enjoy the attention. I would definitely have Regan back again to work on him, especially as he's starting to get a bit older. Regan is an "animal whisperer", they seem to adore her! I used Regan's amazing services for my Senior dog who was having mobility issues. He definately benefited and was able to go on longer walks with less pain as a result. Chris with Oscar and Ollie. Oscar and Oliver's dad, Chris M.
Thank you for allowing Ollie and Oscar to take part in your 8 week massage program. I have observed how happy and energetic they are, after your sessions. I also appreciated the 8 paragraph summary of your working sessions with them. I hadn't realized they have some sensitivity in some areas of their body, due to wear and tear or tightness, as a result of age or overuse. Your recommendations have become invaluable to their ongoing care. We hope to use your service in the near future. Calming raking strokes through Gladys' intercostal muscles. Gladys' dad and mom, Walder and Rachel A. The massage therapy Regan provided our schnoodle Gladys over a two month time frame was invaluable, especially during the introductory phase to her new baby sister. Gladys - who can be quite rambunctious - always displayed a sense of ease and relaxation after each session. Regan was extremely professional, and provided great feedback on Gladys' progress throughout her treatment. We (along with Gladys) look forward to continuing to use Regan's services! Swedish massage treatment for senior pup, Tubby. Tubby thoroughly enjoyed his massages. After his sessions, he was extremely relaxed and more limber. Alfie prefers to sit in my lap for his massages. 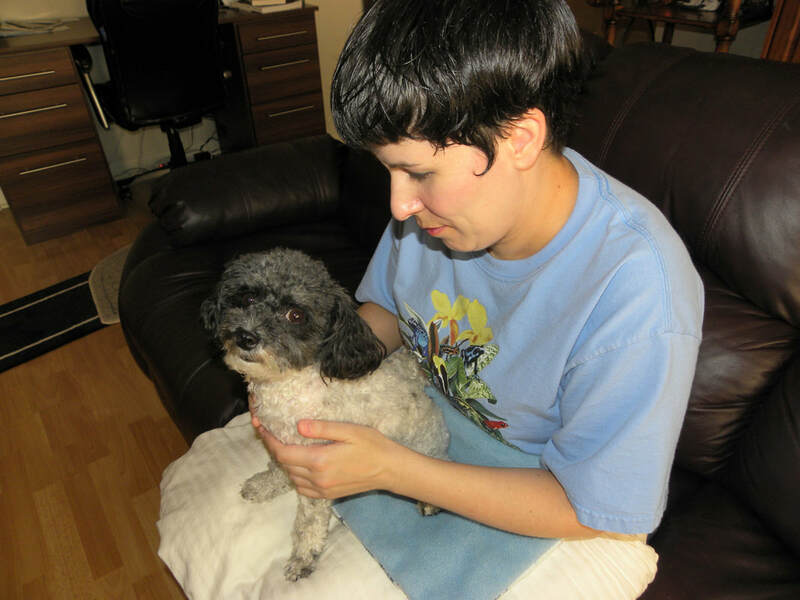 My malti-poo, Alfie, was lucky enough to be included in Regan's massage therapy program over the course of a few weeks. Alfie is very small, has had some health issues - both in the past and ongoing, and is therefore rather sensitive. Regan easily identified Alfie's problem areas and worked according to his specific needs. Alfie always came home relaxed and happy from his sessions. I would happily recommend Regan's services! Some cranial tapotement for Ollie! 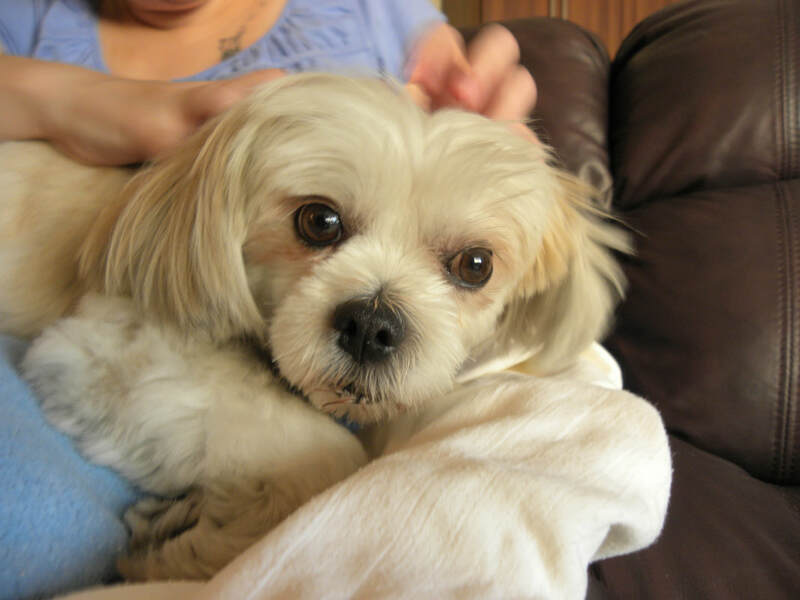 Ollie is a six year old male tri-coloured Coton. Thank you for making him part of your program. We hope that you enjoyed massaging him as he enjoyed the experience - he was always pleased to go with her. Regan gave us the same information that had been provided by an animal chiropractor - but had provided more detail about some issues in his hindquarters. We would be delighted to have Regan continue to work with Ollie. Shelby tries out a Sports massage. I was first introduced to Regan by Chris, the owner of Pet Cuisine, who spoke very highly of her. Chris mentioned that Regan was starting her own canine massage therapy practice and was looking for a few patients to get started. My Great Dane Shelby is now 2 years old however; given her size I realize that ailments such as arthritis and hip dysplasia may become an issue for her later in life. The idea of massage therapy sparked my interest, as I prefer to use natural medicine for my animals. It was at this point that I decided to contact Regan. While talking with Regan I could tell that she was very knowledgeable and was quite professional in nature. After filling out the complete medical/history questionnaire provided by Regan, we decided on a 4 session plan (2 Swedish relaxation massages and 2 sports massages) for Shelby. Regan was very accommodating to mine and Shelby’s schedule and she even picked Shelby up from doggy day care and brought her back with no issues. Regan was very gentle with Shelby and made her feel comfortable. If Shelby ever showed signs of being annoyed or uncomfortable Regan would stop treatment immediately, until Shelby was ready to continue. After each session, Regan provided me with a very detailed report and gave me some recommendations on how to perform at home treatments for Shelby. I would absolutely recommend Regan to my friends and family with animals in their lives. As a huge animal lover and naturalist, I appreciate the efforts that people like Regan take in making animals lives more comfortable. Scarlett receives a lymphatic drainage massage. I have two elder collie-mix dogs - Scarlett & Rhett. Scarlett was the lucky girl when Regan was visiting me in PEI and gave her a lymphatic drainage massage. Scarlett is 'choosey' shall we say, about whom she allows to fuss over her. She seemed to relax almost immediately at Regan's touch and sensed she was being treated for her benefit. It would be wonderful to be able to have Regan follow up with both Scarlett & Rhett but alas, distance (PEI to Toronto) is a problem. Stella receives a lymphatic drainage massage two weeks after surgery. I have a one and a half year old Sheppard mix named Stella. She is a large dog and has a lot of personality. A few weeks after her spay Regan performed a lymphatic drainage massage. Regan was patient, accommodating and won Stella over with her technique and genuine love for animals. Stella loved the massage and gave Regan little nibbles of affection. Stella wasn’t aware of the health benefits the massage gave her, she just had a nice visit at the spa – so to speak. I do not hesitate to recommend Regan and I know Stella wouldn’t either.